Do you have difficulties dealing with the pressure from work and school, or are you simply curious on how to improve your productivity and happiness? 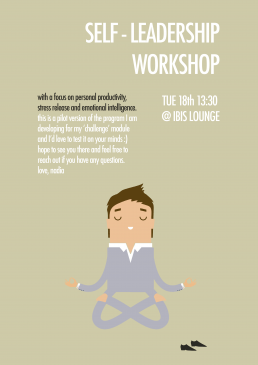 During this course we’ll be hosting an interactive workshop on self-leadership with a focus on improving your personal productivity, stress release and emotional intelligence. The exercises we’ll do there will be targeted towards giving you practical tools and tricks, along with insights, that you can apply in your daily life. Our first pilot of the progam took place on the 18th of October in the IBIS lounge and was a big success. Although the date yet to be announced, we’ll surely host another workshop someday soon.